Destiny 1 Clearance Vault Sale--This Thursday! Thursday! Thursday!!! 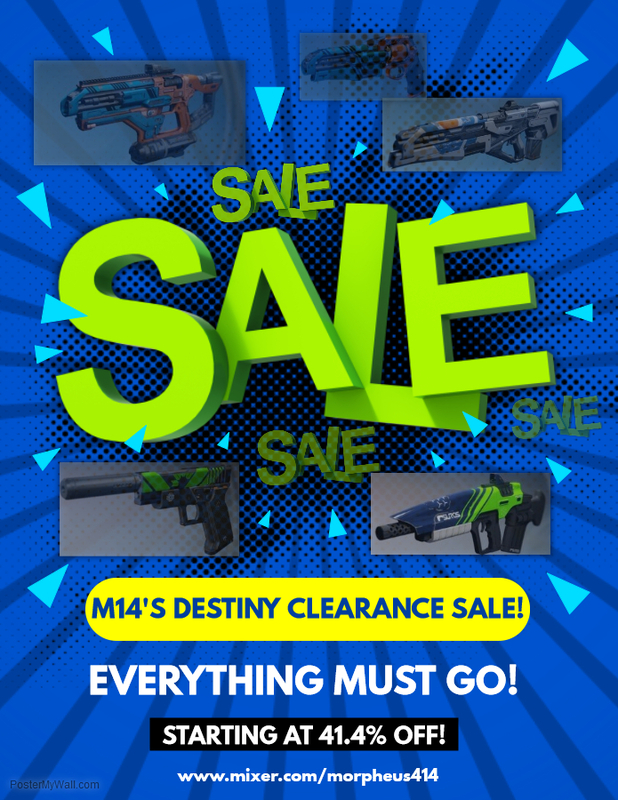 Come one, come all to the special Destiny sale event of the decade! decade! decade! Useless cosmetic crap whose mere existence pissed me off! Don't miss the Early Bird stream where I'll be selling top-tier weapons, LIVE over the Internet! Place your auctions and bid for the vendor and god rolls! Rolls! ROLLS!! Your jaw will drop as some of the most powerful armaments the Crucible has ever seen is offered for purchase! Head to Mixer.com/Morpheus414 on the special day to reserve your spot in the bidding table! TABLE! Afterwards drinks, Pirouette Wafer Sticks, Flavor Blasted Xtra Cheddar Goldfish Crackers, mille-feuille, Onion Rings n' Ketchup flavor Doritos, 4 oz. tubes of generic brand personal lubricant, and other refreshments will be available in the All-Purpose Room B, left half. The North Dakota Wellington Colony Health and Rehabilitation Center will be holding their annual Pokeno tournament in the next room, so neighborly cooperation will be highly appreciated. Chat lines will be open, and we'll have operators on standby to take your order! Orderrrr...! This Thursday, September 14th, 10 AM--only on Mixer!